One should really use the camera as though tomorrow you'd be stricken blind. To live a visual life is an enormous undertaking, practically unattainable. I have only touched it, just touched it. 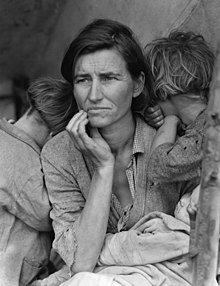 Dorothea Lange (May 25, 1895 – October 11, 1965) was an influential American documentary photographer and photojournalist best known for her Depression-era work. Statement about Lange's most famous photograph titled "Migrant Mother", in Popular Photography (February 1960.